One of the things I love the most about going back to Richmond for visits has been the pleasure of watching it evolve. I would say it has become an even more progressive, food-loving, family-centric city over the last ten years or so. 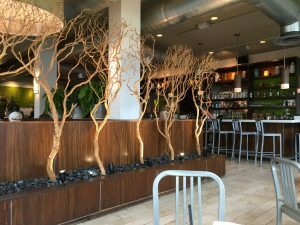 Whenever we are planning a visit, John and I try to include a few new stops at restaurants that offer dairy-free options, which has been surprisingly easy as the city and surrounding area have a lot of vegan and allergy-friendly businesses. 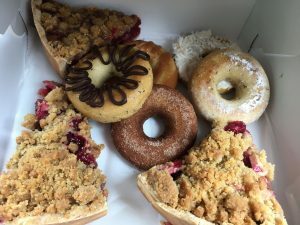 Unfortunately, while central Pennsylvania has a lot going for it, it does NOT have a lot to offer in the way of eating out with dietary restrictions. We have been faced with plenty of rejection here when we’ve requested ingredient info and it is rare to find menus marked with V, DF, Veg, or even G, although gluten awareness seems to be outpacing the other Big 8 common allergens. Also, if I’m being honest, a lot of the options that are available for the dairy-free/vegan set in the area…have a ways to go in the taste department (certainly not all of them, though). 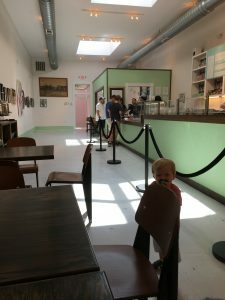 We hope to see this change in the years to come, but in the meantime we pay extra-close attention, and go out of our way to patronize, vegan-friendly locations when we are out-of-town. 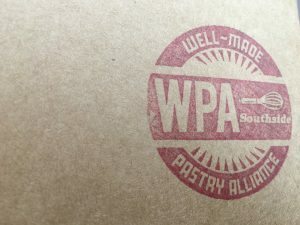 WPA Bakery has two locations, but we opted for the Church Hill locale. We made it there *just* before they closed. They are not exclusively vegan but every Sunday they offer vegan donut varieties. On this particular day, the base for all five of these donuts were the same, but each had a different topping: chocolate, cinnamon/sugar, caramel (my fave), coconut, and powdered sugar. They were more cake-y than some vegan donuts I’ve had, and even though I tend to prefer the fried, yeast-y kind, these were pretty good. The caramel topping was exceptional! All of their fruit pies are vegan and we were lucky that even though we arrived late that day, there were a couple of options still available. We chose raspberry-apple and a mixed berry. The great thing I have found about a lot of pies, even the ones I make at home, is you can make a delightful, flaky crust without dairy, and these slices with crumble on top were tart, sweet, and fantastic. Overall we really enjoyed WPA. The staff was incredibly helpful and friendly and I love supporting the local guy when we can. We will definitely be back in the future. Because we do a lot of cooking and experimenting with food at home, we have been able to replicate a lot of traditionally dairy-full dishes to scratch that itch when we need to. Pastas, mac and “cheese,” pizza, if it’s savory, we tend to have it covered. Unfortunately, my dairy-free baking is hit-or-miss, and donuts have been my personal white whale. I’ve never been able to make a good donut when ALL ingredients were still on the table, so take a few out of the running and I end up with dense, greasy little messes. It is sad. One of the only things I ever miss about having dairy in my life are donuts. Yeasty, light donuts with fresh glaze are some of the best things on the planet as far as I’m concerned. Enter: Sugar Shack. 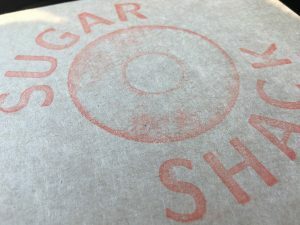 We have been to Sugar Shack on previous trips because they have always put themselves out there as vegan-friendly and have had a vegan option for quite a while. However, previously it was an alternative to their “regular” donuts and, if I remember correctly, they were more of a cake-style. Don’t get me wrong, they were amazing, but like I have said before, I have been hunting for a good vegan yeast donut for a while. 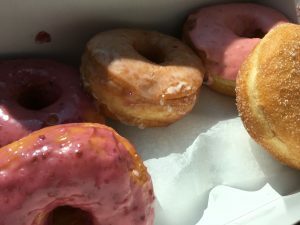 According to a recent article in Style Weekly, nearly all of their donuts are vegan now and GM/dough-maker Mike Goins spent two years perfecting this vegan yeast donut. I cannot stress enough how amazing they are. And not amazing-for-a-vegan-donut amazing but truly, empirically delicious. I would bet next to no one could tell the difference between these donuts and donuts with eggs and dairy. They are simply that good. We went to the flagship Lombardy location and these bad boys didn’t even make it out of the parking lot. There were six in this box. But they were freshly glazed soooo…let’s just say I showed great restraint by stopping to take any photos at all. I’ll be honest. When John first proposed this restaurant to me, I thought it looked a tad too fancy for us to roll up with Oliver. 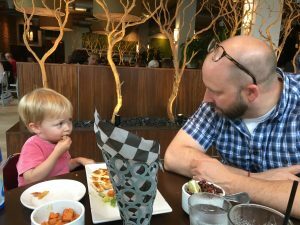 Even though he can be an adventurous eater, at 21 months, he is in full-on moody toddler mode most of the time. Unpredictable is an understatement. 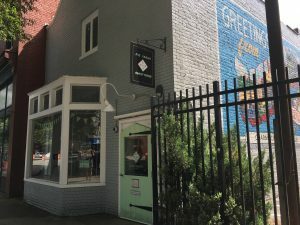 But we wanted to do some shopping in Carytown anyway, so we agreed to do a little fly-by and if the vibe wasn’t child-friendly, we had some back-up options in the area. 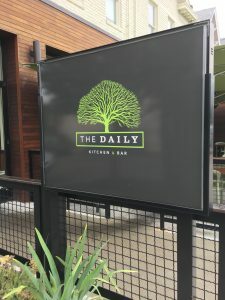 There are so many great things about The Daily, but the big one is they list their entire menu on their website and denote paleo, vegan, and even if it has a vegan option. With a focus on sustainable, local foods (they have a list on their website of where most of their products come from! ), it is a really refreshing place with LOTS of vegan options for us and an easy vibe. Our waiter was very comfortable with our questions and for those he could not answer, he did not seem bothered at all to go back and ask the kitchen for clarification. We were in before their lunch rush so we felt comfortable taking our time and asking enough questions to feel confident in our meal choices. 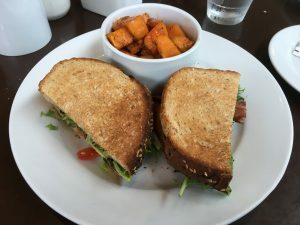 I opted for a BLT with avocado and a side of maple sweet potatoes. The sweet potatoes were probably my absolute favorite thing about this meal. They were sweet and perfectly cooked with a bit of a kick from the pepper. John had chicken tacos with a side of beans and rice. 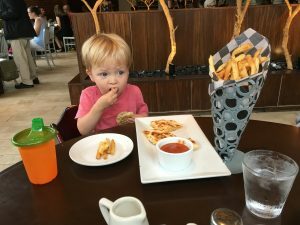 And our little O had a chicken and vegan cheeze quesadilla with sea salt french fries. Overall it was a really hearty meal and we felt confident we were ordering food that fits well with O’s diet. Best of all, Oliver definitely seemed to enjoy his meal! **I feel like it is important to reiterate here that we do not adhere to a vegan diet. I have a lot of respect for those who do, but for now we are only dairy free. Since vegan products by definition do not have dairy in them, we often use that as a barometer in finding eating out options. Baskin Robbins, it ain’t, and it is all the better for it. When we were there, they had about a dozen dairy ice cream flavors available, and another four or so vegan options. 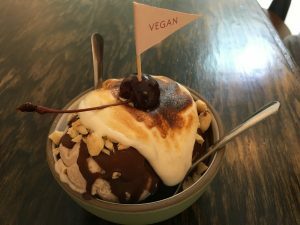 We chose the vegan sundae, which consists of two scoops, Magic Shell, vegan marshmallow fluff, nuts, and a cherry. We also had the option of vegan whipped “cream” but we did not see it in time so we did not get any #regrets. I believe the four vegan flavors there that week were: vanilla, Mexican chocolate, peanut butter fudge, and cereal milk (Cinnamon Toast Crunch). We chose a scoop each of the peanut butter and cereal milk. They torch the fluff slightly for a toasted marshmallow effect. A subtle little flavor detail that really adds something special to this sundae. 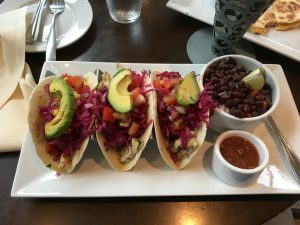 We miss our friends and family in the Richmond area daily, and now we have some memorable food options to add to our list of things we miss while we are away. Until next time, RVA! As Oliver’s first birthday approached, John and I knew we didn’t want to go overboard on our plans for celebrating. Sure, it’s a huge milestone, but the idea of hunting down coordinated cake toppers, themed decorations, and party favors sounded like my idea of a nightmare. I had visions of myself hunched over our kitchen table the night before a huge birthday extravaganza creating perfect little goody bags in the middle of hot glue hell. No, thank you. Besides, let’s face it, this lovely little creature of mine has no tolerance or patience for drawn-out affairs that require him to sit still, eat when we want him to, or interact with a bunch of people at the same time. There will, in my estimation, be plenty of time for that for future birthdays. We did, however, want a cake or some sort of decadent sweet treat for him. We have been so careful with his diet over the past year, particularly when we started with real food (partly because of his galactosemia but more so because I’m so obsessed with making sure he is getting the proper nutrition any infant/toddler needs) that I wanted to give him a chance to go absolutely bananas on a cake for the big day. 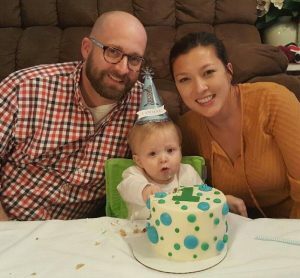 Because we would be traveling to visit our families in the Richmond, Virginia area over Thanksgiving, we thought it would be a nice opportunity to have Ollie try his first cake. Also, because we were traveling, I really didn’t want to have to take over someone else’s kitchen to bake him a cake. 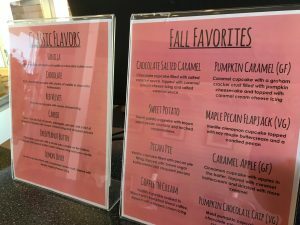 So, a few months beforehand, I contacted Carytown Cupcakes to see if they would be able to fill a special order right around the holiday. Carytown Cupcakes was a favorite of John & I before we went dairy-free and, as luck would have it, they carry vegan cupcakes regularly in their store at 3111 W. Cary Street so we knew they were more than capable. Better still, they don’t just carry an obligatory plain vanilla or chocolate flavor vegan cupcake just so they can say they cater to vegans like some other bakeries we’ve seen. They create fun, delicious vegan flavors (typically two varieties). Flavors like Pumpkin Chocolate Chip, Maple Pecan Flapjack, and Speculous Cookie Butter, to name a few. Whatever the theme is for the store that week, the vegan and dairy-free set are not excluded. Hooray! I contacted the store through email and Facebook and they were responsive and helpful in guiding me through the order process. I feared since my order was on the small-side (a 6-inch tasting cake and one dozen cupcakes) that I might not be made a priority during what is likely a busier time of year for the bakery. However, Jessica and Kevin quickly assuaged my fears. They assured me we could work around the holiday to make sure the cakes were ready for us when we needed them and offered use several options regarding flavors, decorations, and colors. Our vegan flavor options for both the “smash” cake and cupcakes were either or both of the vegan flavors scheduled for that week, a vegan vanilla, or a vegan chocolate. 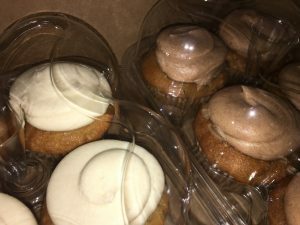 We selected vegan vanilla cake with vegan vanilla buttercream for the 6-inch cake as well as half of the cupcakes and Pumpkin Chocolate Chip for the remaining cupcakes. 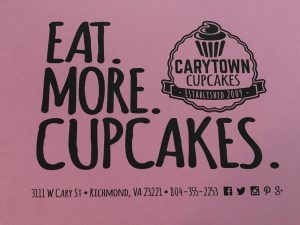 And I have to say, if you think exceedingly dense, gritty, or flavorless when you think vegan cakes, you are sorely mistaken when it comes to Carytown Cupcakes. 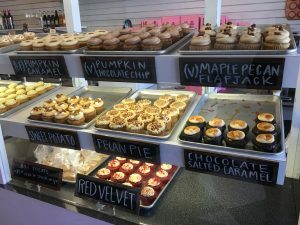 Their cake and cupcakes are substantial, but flavorful and as close to “regular” cupcakes as any I’ve ever had. The vanilla buttercream was smooth and had a true vanilla flavor rather than just tasting like a sweet dollop of icing. The Pumpkin Chocolate Chip tasted just like the holidays should without being too overpoweringly sweet. Also, none of them had that overly greasy feeling that you find sometimes in products where true butter has been substituted with either dairy-free butter or vegetable shortening. 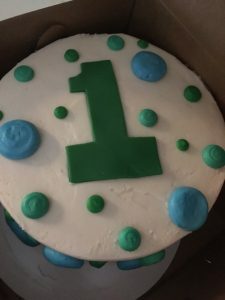 Because we were going to have Oliver smash into the cake, we went with a traditional iced cake with a fondant number but we did have the option of fondant covering the entire cake. I sent Jessica a few inspirational photos for the decorations and left the rest to her very capable hands. I should mention, too, that she was happy to share the ingredients she was going to be using in the cakes in advance so that I could go over them and be sure there wouldn’t be any other ingredients I should be concerned with. For that, I am eternally grateful. We were scheduled to pick up our order on a Wednesday after 12:00pm, and it was ready and waiting when we got there just after noon. They included instructions for serving the cakes and cupcakes, and the cupcakes were packaged in freezable containers in case we were not going to serve them within the first day or so after picking them up. 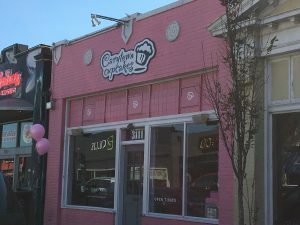 In the end, I cannot praise Carytown Cupcakes enough. Their customer service and products were stellar. We will continue to visit them every time we visit the Richmond area. Yes, do what that box says.